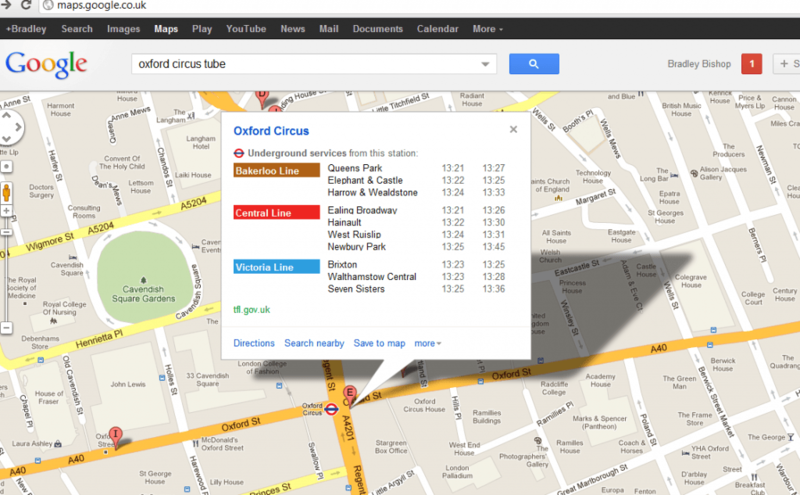 Exciting news came out of Google HQ today when they released their latest Maps feature, real –time tube updates. The perfect tool for the 2 million London commuters that use the Tube every day. Just under a year after they added London Transport directions to their nifty maps function, Google have gone the extra distance by bringing out their latest time saving feature and it’s just in time for the Olympics, with 99 days to go. To find out the latest tube times all you will have to do is go to Google Maps, find the station you are looking for and click the station icon. You will then get a Google pop up display showing you which lines run from the station, where they are going to and what time the trains are departing. It might not be Google’s most ground breaking or innovative feature but it’s something they can add to their forever improving maps that will make our lives a little bit easier.